On April 30, 2015 Millennium submitted an application with the Federal Energy Regulatory Commission (FERC) to commence the pre-filing review process with respect to a new lateral pipeline project (the Project) to the proposed CPV Valley Energy Center. 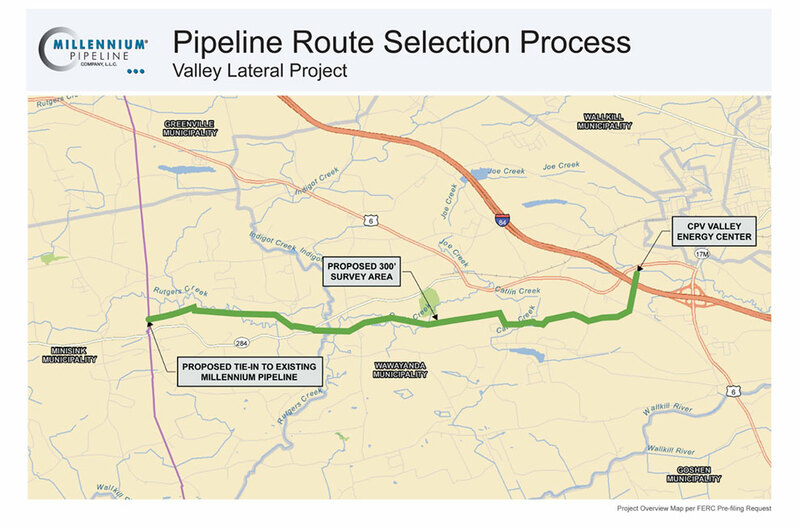 Millennium is proposing a new Project that will involve the installation of approximately 7.8 miles of 16 inch lateral pipeline between Millennium’s mainline in Orange County, New York and the CPV Valley Energy Center in Wawayanda, Orange County, New York. The Project will not require any additional construction or modification to the existing Millennium system.As part of the pre-filing review process, Millennium is committed to continuing its review of the route alignments with stakeholders and working to accommodate their concerns. As Millennium continues these ongoing efforts to refine and finalize the route alignments, updates will be provided. The Project will be designed to transport approximately 130,000 Dth/day of natural gas from Millennium’s mainline to the CPV Valley Energy Center. In March 2015, Millennium executed a binding precedent agreement with CPV for the entire capacity of the Project. Our top priority is to ensure public safety through responsible operations. We are proud of our unwavering commitment to the safety of our employees, our contractors, the environment, and the communities we serve. Our gas control and monitoring center officers operate 24 hours a day, seven days a week. We regularly patrol our pipeline right-of-way. We conduct regular inspections of our pipeline system, and our Operations employees receive regular training and are qualified under U.S. Department of Transportation regulations for natural gas pipeline operators. Employees are on call at all times, ready to respond to any situation. The Valley Lateral Project represents a final step in the development of this community supported project, and brings the region a step closer to lower energy prices, new jobs, and greater economic activity. Millennium has already begun an extensive outreach program to landowners and communities in areas where the Valley Lateral Pipeline will run. Prior to construction, the project will undergo a comprehensive and transparent review process overseen by the Federal Energy Regulatory Commission. All throughout the review process, Millennium will continue to work closely with local landowners, residents, and communities to guarantee community involvement in the process. Project InformationThe following fact sheets contain information on important aspects of the project and were distributed at Millennium’s June 10, 2015 Open House meeting.